Bro, Do You Even Drift? The dream of becoming a stunt car driver never came to fruition but, you live life still asking yourself...what it? Instead of fulfilling this passion by taking to the street to compete in drag race competitions, you prefer to lay low and practice driving skills by handling a video game controller instead of a motor vehicle. That's how you roll now. (It's much safer and takes less energy too. A win/win!) But now incorporating both of your passions, driving and gaming, is a real possibility. 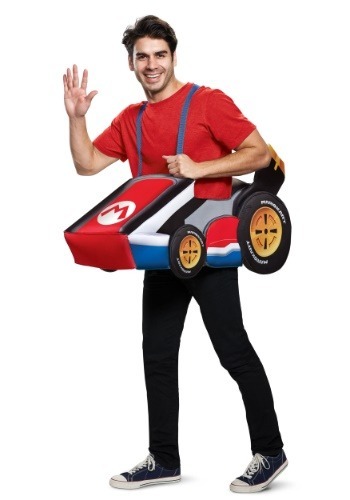 Wear a Super Mario Kart adult costume and turn your quiet neighborhood into a whimsy Mario Kart track. Who needs virtual reality when you can have this? Strap yourself into the foam vehicle and show Bowser once and for all it is YOU who owns every course, from Rainbow Road to the new neighborhood one just created. Consider buying bananas in bulk because if you want to be the one holding the trophy at the finish line having a lot of banana peels is a must. The foam cart is adjustable and can be fastened to fit all adults, men and women. 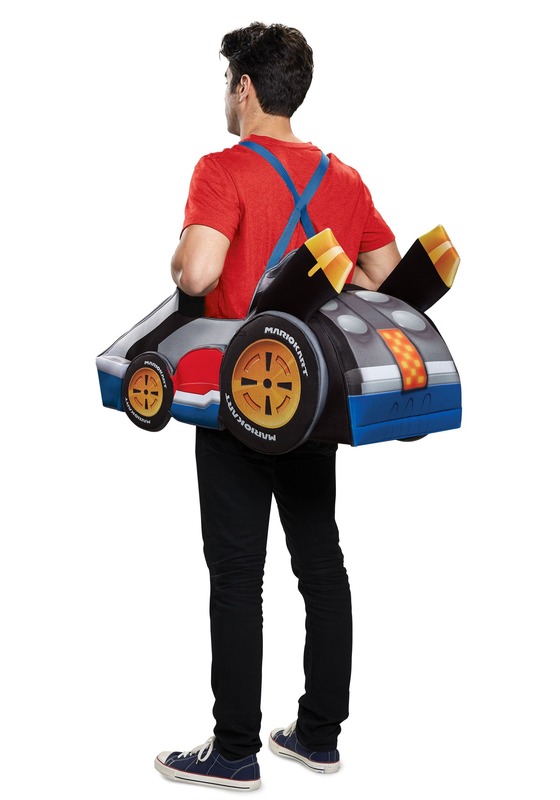 The blue straps are holding up the officially licensed foam tunic which is designed to match Mario's signature red, white, black and blue "M" kart so it looks exactly like the one from the popular video game. Just step into the costume and pull up the shoulder straps and now you're ready to race. It's a great conversation starter for bar crawls and other social events because it tempts others into a friendly challenge. Be prepared to hear the chummy inquiry, "wanna kart?" numerous times throughout the evening. Now video games can become an outdoor activity for sunny spring and summer days with this one-of-a-kind costume. All your gaming buddies can get in on the fun by picking up the Luigi and Princess Peach Kart costumes too.